I’ve never combined strawberries and peaches in a baked dessert before and now that I’ve tried it, I’m not sure why I waited so long. Two of my all-time favorite desserts are Peach Cobbler and Strawberry Shortcake and this cobbler basically combines the two flavors – especially if you top it with a dollop of whipped cream or a scoop of vanilla ice cream! This week marks the beginning of Summer Fest, a season-long celebration of fresh fruits and vegetables in which a group of fun food bloggers join up with The Food Network Dish to share weekly recipes and tips surrounding a specific topic. I’ve participated in the past and am excited to be on board again. This week we’re all talking about berries so I decided to stick with strawberries since I’ve been learning so much about them lately. Here’s an interesting tidbit that I learned on the Strawberry tour that I just hadn’t really thought about before. Since strawberries are so delicate and perishable, they are not washed or cleaned in any way before being packaged for the grocery store. When they are picked in the field, they are put directly into the container that you buy at the store. Because of this, you should wash them before eating, but you should never wash strawberries until you are ready to eat them. If you wash them and then try to store them in the refrigerator, they won’t last nearly as long (which is why they aren’t washed before being sold). Also, always store strawberries in the refrigerator! They won’t last long at all if you keep them on the counter. I hope you’ll visit some of the other Summer Fest blogs to see what other berries are being talked about today. The list of links is below the recipe and they will also be available to peruse on the group Pinterest Board, if you’re into that kind of thing. 2. Put peaches and strawberries in a large bowl. In a smaller bowl, whisk together brown sugar, tapioca powder, cardamom, and salt, breaking up any lumps in the brown sugar. Stir sugar mixture into the fruit and pour into a 2-quart baking dish; set aside. 3. In a separate bowl, whisk together flour, almond meal, sugar, baking powder, and salt. Work butter pieces into the flour using your fingertips or a pastry blender until the mixture looks like coarse crumbs and no large pieces of butter are visible. 4. In a measuring cup, whisk together the egg and milk. Pour egg mixture into the flour mixture and stir just until all the flour has been incorporated. 5. Drop the topping mixtures by large spoonfuls over the peaches and strawberries and sprinkle the whole thing with coarse sugar, if desired. 6. Bake cobbler in the middle of a 375 degree oven for 27-30 minutes, turning the pan halfway through the cooking time to ensure even browning. Cobbler is done when the filling is bubbly, the biscuit topping is golden brown, and a toothpick inserted through the thickest part of the topping comes out clean. *After experimenting with different thickeners, I’ve found that I like tapioca the best, but it works better ground into a powder (or just use tapioca flour if you have it) when used in a cobbler where the filling is partially exposed – the little beads that are left exposed on top turn hard in the heat of the oven. I just keep some instant tapioca in the pantry and grind it up for cobblers, but if you don’t have a way to grind it, you may substitute flour or corn starch for the tapioca. **If you don’t like cardamom or don’t have any on hand, you may leave out the spice completely or substitute with cinnamon, nutmeg, or ginger. ***I tested this recipe using White Lily all-purpose flour, which isn’t available in all parts of the country, because it produces a very tender biscuit topping. If you don’t have access to White Lily, you can substitute 3/4 cup of another brand of all-purpose flour mixed with 1/4 cup cake flour OR 1 cup King Arthur Unbleached Cake Flour Blend (those two options will give you results similar to using White Lily) OR just use whatever all-purpose flour you have on hand – the topping might be slightly tougher but it will still be delicious and you probably won’t notice. If you prefer to use White Lily Self-Rising Flour, leave out the baking powder and salt in the recipe (I haven’t tested this, but it should work fine). This looks so rustic and delicious! Peach and strawberry sounds terrific together. My two favorite fruits! This is my version of dessert heaven. OMG- This looks amazing! I love the addition of almond! Have you tried roasting strawberries? It's a different idea but looked so good I tried it and it works great though juiciness varies. It's from: http://thewimpyvegetarian.com/2013/06/roasted-strawberries/ and two recipes for using the berries though I loved them plain on Greek yogurt or vanilla ice cream. http://thewimpyvegetarian.com/2013/06/roasted-strawberries-and-honey-ricotta-on-crackers/ and http://thewimpyvegetarian.com/2013/05/gluten-free-friday-desserts-roasted-berries-coconut-lime/ PS - your blog has been a top favorite for many years, and still is! Like your simplicity and style. Rosemary - I've had roasted strawberries in a dessert before but I've never tried it myself. Thanks for the tip! 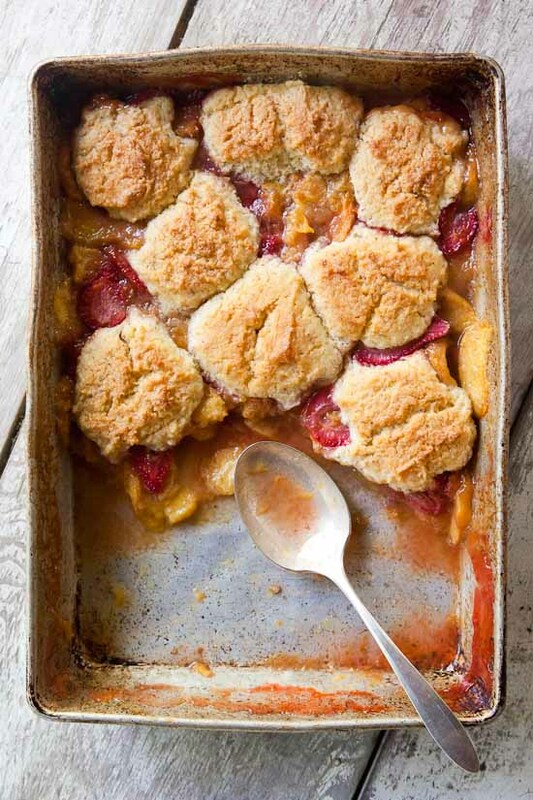 Beautiful picture, delicious cobbler.. love the strawberries with the peach! Love the rustic charm of this dessert!!! Paired with some ice cream!! YUM! Wow- i can see the yummy liquid coming out of the fruit! It looks wonderful. 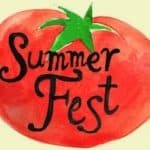 Thanks for the Summerfest schedule- food DOES taste better when it's in season. Thanks also for the copious notes on the recipe. Very helpful! I LOVE strawberries and peaches together! My favorite (and I don't say that lightly) pie is a strawberry-peach slab pie (modeled after the smitten kitchen cherry slab pie, with almond and vanilla extract)...they're both in peak season for such a short period of time but their flavors work together so well. The cobbler looks delicious and a great new way to enjoy my favorite pie. I like to use tapioca starch, too, and discovered, like you, that I could easily make it myself. I grind it up in the Vitamix from small tapioca pearls. The peaches are not yet in at our farmer's market though the strawberries are, this looks like a great combination for a little later in the season. I like the bit of almond meal in the topping, I'll bet that adds some good texture. We're just leaving strawberry season where I live and moving into blueberries, and they are amazing with peaches too. But your recent strawberry posts reminded me of my favorite book as a child, "A Present for the Princess." It was one of those dollar cardboard books, and now it's $50 on Amazon. Yikes! This sounds amazing!! I love putting strawberries and peaches on my yogurt in the morning, but have yet to bake anything with both! This recipe doesn't say what to do with the butter. It just says to melt it in the pan.... But then what? The peaches are not yet in at our farmer’s market though the strawberries are, this looks like a great combination for a little later in the season. I wish you could have a print friendly version of this recipe.